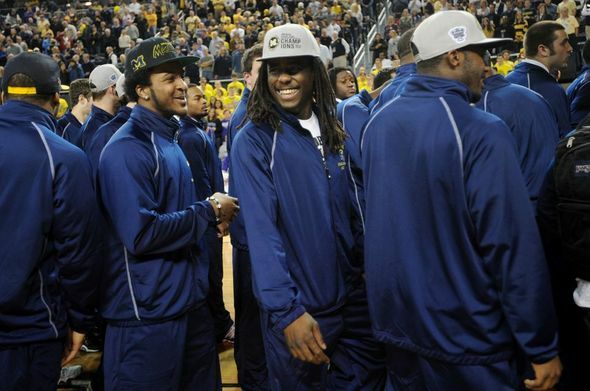 Posted on Wed, Jan 11, 2012 : 10:21 p.m.
Michigan quarterback Denard Robinson smiles as he exits the floor with teammates after the football team was honored during a timeout at the Crisler Center on Wedensday. One of the loudest ovations inside the Crisler Center on Wednesday was awarded to the Michigan football team. The Wolverines were honored during the first half of the Michigan basketball team's 66-64 win over Northwestern, taking a collective bow with the 2012 Sugar Bowl trophy in hand. Michigan senior tri-captain David Molk led the team out through the tunnel onto the court, hoisting the trophy above his head. After the small recognition ceremony, most of the team grabbed a seat to watch the remainder basketball game. Junior quarterback Denard Robinson, junior receiver Roy Roundtree, and others went one step further, watching the rest of the game from seats inside the "Maize Rage" -- the Michigan basketball team's student section. Before the game, fans inside Crisler Center were given an opportunity to take a photograph with the Sugar Bowl trophy on display inside the arena concourse. Thu, Jan 12, 2012 : 11:50 p.m.
After the players went into the Maize Rage they where then kicked out because they didn't have a ticket. That is my guess. Or Dave made them buy a ticket. sorry but that was a lousy attempt at a 'tribute' to the sugar bowl winners. rather than introducing the team at halftime, they were rushed in halfway through a scheduled timeout. none of the players spoke-----not even a captain-----no coaches were asked to say a word. not well planned at all-----sorry. Maybe they dusted off an old plan from WFCIMH's forgotten files and used it? :) GO BLUE! Should've given them a heisman......did anyone see Al Borges? He's usually pretty easy to spot!! Thu, Jan 12, 2012 : 1:16 p.m. Seeing Denard and the other fellows jumping up and down in the maize rage during the game was very cool to see. Also made me realize that the maize rage is really out of shape and could use some kind of workout program. Thu, Jan 12, 2012 : 11:29 a.m.
Fri, Jan 13, 2012 : 11:49 a.m.
Did you find any evidence of it (any green or red shreds of clothing) on your bushes or fence that may give you a clue as how that &quot;water break&quot; happened? :) Hope all is well with your home. Thu, Jan 12, 2012 : 5:20 a.m.
That was really cool to see Tom Brady and Charles Woodson doing the &quot;This is Michigan&quot; intro. Really makes me excited for next year.